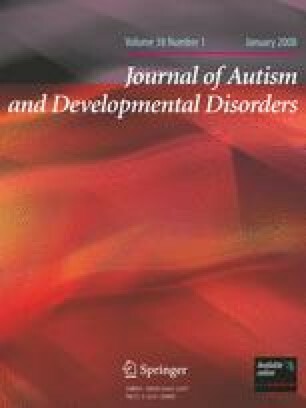 Are children with autism able to adopt, and shift among, the psychological perspectives of different people? Fifteen children with autism and 15 without autism, matched for chronological age and verbal ability, were given Feffer’s (1970) role-taking task in which they were asked to tell and then re-tell stories from different protagonists’ perspectives. The children with autism understood the task, adjusted narratives according to alternative viewpoints, and were similar to control participants in their use of mental state terms. Despite this, the children with autism achieved significantly lower scores for adopting different figures’ perspectives, and for shifting among complementary viewpoints. The results illustrate aspects of social-cognitive impairment that extend beyond the children’s limitations in ‘theory of mind’ understanding. This research was conducted in part fulfillment of a PhD in the University of London by the first author, and was supported by grants from the Baily Thomas Charitable Trust and the NHS R&D funding. The writing up was completed when the second author was at the Center for Advanced Study in the Behavioral Sciences, Stanford. We would like to thank the students and staff of the Helen Allison and Edith Borthwick Schools, whose participation made this study possible. We are grateful to Derek Moore (who produced the drawings), Gayathri Chidambi and Jessica Meyer (now Hobson) for their input at different stages of the study. A participant received a score of 0 when the story was not described from the point of view of the main character and there was a failure to capture the perspectives of other characters. She [a little girl] went in the car, so the policeman got out of the way, and went round the block and she jumped out of the car, and she kicked a ball in the road and the car knocked, crashed, and the policeman cried as she kicked him and the policeman died. It was a policelady. This is the other teacher and this was her Dad coming in, and everybody went out to play ... and he went out the door. And then she [the teacher] was very quietly doing her work and all the rest were giggling and throwing pencils at her. And she was just sitting there, and everybody had to stand by the wall. A participant received a score of 1 when there was some elaboration of the perspectives of the characters of the story, but still it was unclear that the participant was taking the perspective of the main figure. For instance, the use of dialogue could be a sign that the participant had some degree of understanding different perspectives. One day a little boy went for a walk, and it rain and he went back home. He was feeling ill. Doctor came around. [Doctor] “Doctor’s here now. Mum she looked after you.” [Mother] “I’m here little boy. I’m here.” Doctor said, “Here are the medicines that you put on.” Up together again. Then he had to move back to the hospital now. Mum sits down, “Aaah.” There he is. They back together now. The end. [boy] “Hi Sue.” [girl] “Hi, What have you done to your leg?” [boy] “Oh I fell off the cliff. Went on holiday.” [girl] “Did you have a nice holiday?” [boy] “Yeah I did, but I fell off the cliff, that is why I have got a broken leg”. A participant received a score of 2 when he or she described the main character according to his or her role, but not in accordance with his or her own perspective. Showing a correct use of personal pronouns (for instance, to use ‘I’ every time that reference was made to the main role-taking character) was enough to receive a score of 2. I’m the Mum and I’m doin’ the nurse. And helpin’ the boy is on crutches with the plaster leg. And the Dad is waiting. A participant received a score of 3 when the story was described from the point of view of the main character, in terms of specific actions and perceptions. Once upon a time I was coming, I was walking through the door and I saw my big brother and my small brother and I gave them a present. I gave Andrew a watch, my small brother a watch and my big brother a coat. Once upon a time I was a robber, and when I went in the shop, I got a gun, and said “give me the money”. I look in the window and the policeman comes. The highest score of 4 was given when the participant used psychological terms when retelling a story from the main character’s viewpoint. I was in Brixton prison, they thought they could trust me, but they couldn’t, so they let me outside to do some work, and when I put all the stuff in the lorry I run off. Oh, my dad bought me a dog for my birthday, cos I really love a dog, and he also got me a motor car, and I really liked the car ... and it [the dog] swallowed a bit, and its neck got caught ... and it died ... I wanted my dog back, it was dead. So I had to have one of my Mum’s friend’s puppies, and I got to like the puppy, and the puppy got to like me.